How to become a fighter pilot in the USA? Military pilots, especially those flying on a supersonic aircraft belong to one of the most respectable and elite groups in the U. S. Armed Forces. Their profession is on the list of the most interesting and amazing job. After all, who does not want to be, even for a second, like Tom Cruise and take off from a carrier while watching the movie “Top Gun”? No wonder so many young people dream about it and link their future with it. Every branch of the United States Armed Forces is equipped with a military aircraft, but only the U.S. Air Force, U.S. Navy and U.S. Marine Corps have fighter jets. The road to become a military pilot, especially a fighter pilot is tough and not possible for everybody. First and most important is a college degree. To be a military pilot you need to become an officer and to be an officer you need a college degree. This means one needs to have bachelor’s degree and completed Officers Candidate School (OCS) to become a fighter jet pilot. Also becoming an officer does not guarantee flying a fighter jet before being commissioned as a pilot. This is due to the fact that medical and physical requirements are so high and those who cannot fulfill them cannot become fighter pilots. For those who are still in high school and aspire to be a fighter pilot the best way is through the Air Forces and the Naval Academies. Entering one of the academies is extremely difficult and it calls for hard work during high school. Not only high ranks and perfect exam results are a minimum requirement, but also extra activities that prove leadership abilities or athletic skills are necessary. Moreover, recommendation letters and support from local congress people is very helpful. However, after entering the academy there is still a lot to do. Many cadets desire the pilot slots and competition begins again. Being commissioned as a pilot depends on the class rank, extra activities and, of course, medical and physical predispositions. 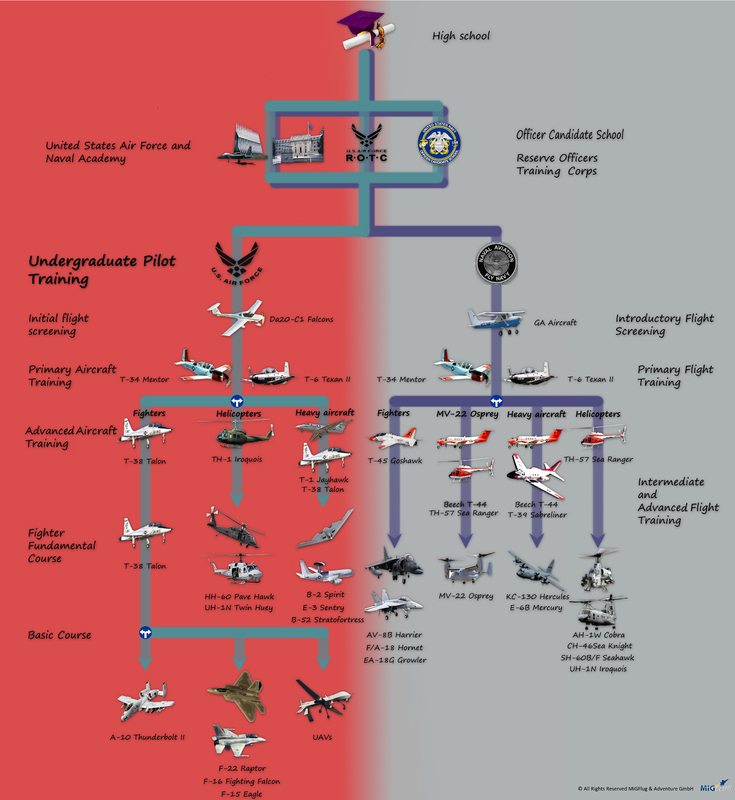 For those lucky young cadets in the Air Force Academies there is the Undergraduate Pilot Training (UPT), a 1-year-long initial flight training. It starts with a screening program, similar to the Private Pilot License course. After it, the class is split into those who will fly helicopters, heavy aircraft and fighter jets. The priority of choice is given to the best students and they will probably fly supersonic jets in the future. The rest has to settle for the other aircrafts. Those cadets who receive fighters compete during the rest of the course for the opportunity to become a pilot of a plane they would like to fly. Again it does depend on the class rank, instructor’s opinion and the Air Force’s demand. Finally, after this great competition and graduation a pilot training cadet waits for the centrifuge and survival training. For those who pass it, the Introduction to Fighter Fundamentals course (IFF) begins and it is performed on Northrop T-38 Talon. This is the last flying course before going to operational Major Weapon System (major aircraft). The basic course (B-course) and the introductory training course for the chosen fighters is the last stop before being transferred to an operational unit. After several months of training a cadet becomes a Mission Ready (MR) wingman and a full operational fighter pilot. The road to become the fighter pilot after the Navy Academies looks similar, especially during the first years. After gaining a pilot slot the training starts with the Introductory Flight Screening (IFS) and Aviation Preflight Indoctrination (API). Following the API completion the Primary Flight Training begins and students pilots learn to fly the T-6 Texan II Beechcraft or the T-34C Turbo Mentor. At this point cadets choose the Intermediate and Advance Flight Training paths: helicopters, the MV-22 Osprey, heavy military planes and finally Tailhook aircraft. After an advanced training, pilots go to Fleet Replacement Squadrons (FRS) where they start flying on their specific aircraft. The second way to become a fighter pilot is Reserve Officer’s Training Corps (ROTS). This solution is for those who want to study in a normal way as a civil, but along with the preparation training for officers during a college or a university education. The student’s duty is to attend a military training and courses, mostly at the weekends, and spend at least one summer on a training camp. When the officer training is complete, there is an option to apply for the pilot training. The competition is fierce and requirements are high so it is a difficult way, but in the end you can gain the pilot slot and start UPT or IFS training. The third and last way for future pilots is the Officer Candidate School (OCS), also known as the Officer’s training school. Those who graduate civil colleges and gain a bachelor’s degree without a military background can attend officer courses. During four months of training a cadet can become an officer and apply for the pilot training. The same rule applies to this group: great medical and psychical condition is required, moreover applicants have to be before the age of twenty-seven. This all means that there is not much time left after studies to become a military pilot. http://www.baseops.net/militarypilot/fighterpilot.html – More detailed information about gaining a pilot slot. http://www.flyfighterjet.com/jetflights/red-flag-exercise.html – How does one of the most advanced aerial exercise look like? Check here. 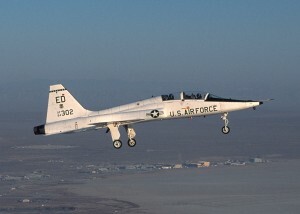 http://www.flyfighterjet.com/jetflights/fly-with-the-blue-angels.html – One of the ways to fly a fighter jet. http://www.youtube.com/watch?v=EKlbHT6N4YI – A T-6 Texan II during training. You have to watch it. http://www.flyfighterjet.com/wp-content/uploads/2015/04/transparent-logo-300x138.png 0 0 FlyFighterJet http://www.flyfighterjet.com/wp-content/uploads/2015/04/transparent-logo-300x138.png FlyFighterJet2012-12-19 16:54:552012-12-19 16:54:55How to become a fighter pilot in the USA? or simply use the contact form. Click one of the buttons below to buy your military airplane flight now. Payments can be done directly with VISA and Mastercard. Years of experience and 100% satisfied customers make FlyFighterJets.com your contact point if you'd like to fly a fighter jet such as the MiG-29, MiG-31 or L-39. "Flying the MiG-29 is a feeling beyond comparison. Thank you for making this possible!" - Michelle, University Lecturer from the UK.